Fluoride is one of the minerals that is commonly found in different household products. If a toxic amount of fluoride is present in the body, it will cause an overdose and produce adverse effects in the body [1, 2]. Fluoride occurs in the body as calcium fluoride and it is mainly found in the teeth and bones. Fluoride is primarily use in order to prevent the occurrence of tooth decay. There are countries where fluoride is added in community water system to help children achieve the recommended daily amount of fluoride. Aside from toothpaste, this mineral is also found in dietary supplements, products for oral hygiene, insecticides and cleaning products for cars. Side effects associated with the intake of fluoride include muscle weakness and problems of the nervous system. Fluoride is also present in infant formulas and this the only way that infants can receive their fluoride intake [1, 2, 3, 4]. How much is Fluoride Toxicity? Fluoride toxicity usually occurs by routinely ingesting products that contains fluoride such as toothpaste. Small amount of fluoride is safe for human but ingesting about 5-10g of fluoride at one time can produce toxic effects. For reference, toothpaste contains 1mg of fluoride for every gram. Other products have different amount of fluoride in their preparation and users should be aware of the amount of fluoride present [1, 2, 3, 4]. What are Fluoride Toxicity symptoms? The symptoms that may be experienced after overdosing on fluoride are primarily related to the gastrointestinal symptoms. The person may experience pain in the abdomen, injury to the mucosa, diarrhea, vomiting, nausea, difficulty in swallowing and increased production of saliva. Neurologic symptoms may also be present. These symptoms include reflexes that are hyperactive, muscle weakness, spasm of some muscles, headache, seizures and tremors. Cardiovascular symptoms that may be present include cardiac arrhythmias, shock, ECG changes and cardiac arrest [1, 2, 3, 4, 5, 6]. What is Fluoride Toxicity management? Information about the ingestion of fluoride is important in the management of fluoride toxicity. The name of the product ingested, amount and the time the ingestion occurred should be relayed to the physician. Once the patient arrives in the emergency room, they will be connected to a cardiac monitor and an electrocardiogram machine. An intravenous access will be established for the administration of medications. Electrolyte imbalance such as hypocalcemia, hypomagnesemia and hyperkalemia. The deficiency in calcium can be managed with the use of calcium gluconate or calcium chloride that is administered intravenously. Activated charcoal is ineffective in fluoride overdose so a gastric lavage is performed instead. The use of calcium chloride in the lavage is beneficial in binding the fluoride in the stomach. The lavage is most beneficial if it is performed 1 hour after the ingestion. If the previous treatment methods are ineffective, the patient may have to undergo hemodialysis. The prognosis of patients who suffered fluoride toxicity is dependent on the amount of fluoride that was ingested and how soon medical intervention was started. The sooner the toxicity is managed, the better their chance of recovery is. [1, 2, 3, 4, 5, 6]. How to prevent Fluoride Toxicity? The most effective way to prevent the toxicity if fluoride is to avoid swallowing products that contains fluoride. Children must be taught to not swallow the toothpaste while they are brushing their teeth. Any side effects that is noticed should be referred immediately to the physician in order to receive prompt medical attention and prevent the development of complications [1, 2, 3, 4, 5, 6]. 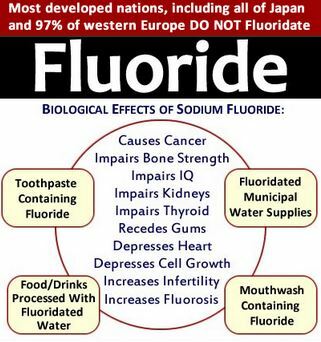 Fluoride toxicity is a real danger and everyone is at risk for this. If you got more information about this, please feel free to share it in the comment section below.